Galong (third left), Jamit (fourth left), Martin (right) and others give their approval for ‘kelulut’ farming. KAPIT: Landowners are encouraged to venture into bee breeding industry to produce ‘madu kelulut’ (kelulut honey) because of its great potential in the market. Bukit Goram assemblyman Jefferson Jamit Unyat said there is great demand for ‘madu kelulut’ because of its nutritional value and wide usage, and consumers are willing to pay high price for the natural honey. 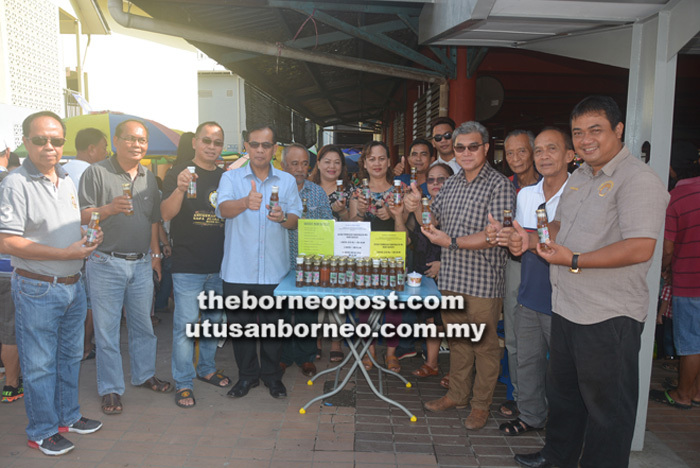 “Thus, I encourage landowners here to venture into ‘kelulut’ honey culture that could generate good income for them,” he said when visiting the promotion stall of ‘Madu Kelulut Asli’ at Terasang Market here organised by Koperasi Usahawan Bumiputera Kapit Berhad (KUBK) yesterday. Seeing the great potential of the honey industry, he suggested that the landowners group together to form a cooperative like KUBK, which has a pioneer ‘madu kelulut’ project at the fruit gardens in Sungai Amang area, Jalan Selirik. “You have the land mass covered with a great variety of flora which is ideal for bee breeding. Fruit gardens are also ideal for bee breeding,” he said. He informed that KUBK received assistance like financial support, knowledge input and technical support from Cooperative Malaysia, which they could also get if they formed a cooperative. Present to welcome Jamit were KUBK chairman Watson Awan and his members, Penghulu Madang Jelaini Jarit, Penghulu Pasang Tubak and Tuai Rumah Richard Engking. Also present were Deputy Kapit Resident Galong Luang, Pemanca Wasli Nor and Pemanca David Dian.